One of the most beautiful nooks of a decidedly beautiful country, Nature's Valley is an enchanting and relatively undiscovered holiday resort on the Garden Route, about 18 miles (29km) from Plettenberg Bay. Surrounded by the Tsitsikamma National Forest, Nature's Valley is a gorgeously lush area of tall bearded trees, monkey ropes, and rich bird life. It also happens to sport one of the prettiest coastlines in the country. Featuring great weather all year round and a decided lack of non-essential infrastructure, Nature's Valley is the perfect place to go for tourists looking to relax and rejuvenate in peace and quiet. There are plenty of scenic walks and hiking trails for the adventure enthusiast. 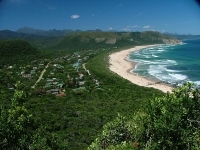 In fact, Nature's Valley marks the end of the Otter Trail, one of South Africa's most famous hikes. Canoeing down the river and swimming in the sheltered lagoon are also fun excursions. Accommodation in Nature's Valley comes in all shapes and sizes: from luxury villas which can be rented on a monthly basis, to the excellent Wild Spirit Lodge and Backpacker Hostel, which offers affordable lodging in a funky and eco-friendly environment. If you're due to travel on South Africa's Garden Route, you are strongly encouraged to stop in at Nature's Valley for a night or two. But just be careful, as the idyllic atmosphere of the place might keep you around longer than you'd originally planned.